Jenny Good began writing professionally in 2005, offering career- and life-coaching advice online. Good has a technical degree in early childhood education and studied career coaching through ReCareer, Inc. She is completing a Bachelor of Science in psychology at Southern New Hampshire University. Without a doubt, we live in a high-tech world. It seems a new gadget for promoting better health comes along every day; but according to Life Span, a simple rocking chair can improve your health and increase overall well-being. While using a rocking chair won't provide the fitness training of an aerobic workout, the activity may improve your health in some significant ways. 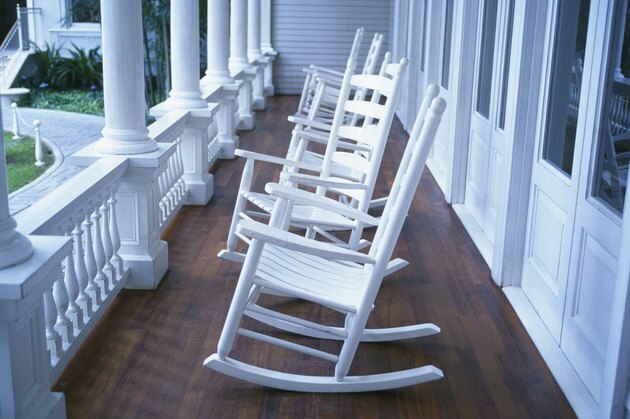 Rocking Chair Therapy reports that a study conducted at the University of Rochester reveals an increase in the psychological well-being of nursing home residents with severe forms of dementia. The study suggests rocking causes a release of endorphins that elevates the mood of dementia patients, in addition to relieving pain. Study leader Nancy. M. Watson, PhD, RN, director of Center for Clinical Research on Aging, noted that rocking has long been known to soothe infants, and it seems to provide the same therapeutic benefit for adults. Watson explained that rocking causes a reduction in anxiety and depression among seniors, and reported a decreased need for anxiety and depression medication in those who she observed. Because these medications sometimes come with harmful side effects, rocking may prove a more tolerable option for some people dealing with these conditions. The motion of rocking stimulates the body to maintain balance, resulting in greater balance capabilities. Greater balance is especially useful in older individuals, who face an increased risk of injury by falling. Rocking provides a way to tone the leg muscles of those who cannot tolerate weight-bearing exercise. Rocking brings a safe activity to people who live an otherwise sedentary lifestyle. Although rocking does not make up for strength-training exercises such as lifting weights, it may be a valuable strengthening option for those unable to perform more strenuous activities. Rocking mimics the movement the baby felt inside the mother's womb. Rocking a baby who suffers from colic reduces crying episodes and promotes sleep. Rocking also might promote restful sleep in babies not diagnosed with colic disorder. ADK Rocking Festival reports that President John F. Kennedy used a rocking chair to help relieve back pain, as prescribed by his doctor. According to the festival website, rocking helps prevent pain signals from traveling from the back to the brain. The site also claims that rocking can significantly improve pain from arthritis.